For Today’s Tuesday Madness Sale we have some gorgeous items for you! We want to continue bringing you the best of our items and some great deals as well. From Lapis to Garnet’s today’s set is just what you could be looking for. 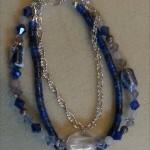 We of course have Four lovely items for you today to choose from, First up is our Blue Lapis and Quartz Crystal Bracelet this gorgeous beauty is striking bracelet is with its Blue Lapis Lazuli, Rose Quartz, Lamp-work glass and Swarovski crystals all strung together to create this multi-strand bracelet. Our Second item we have for you is a beautiful pair of Red Agate Drop Earrings, these earrings have rich beautiful colors that are just right for that beautiful fall outfit. 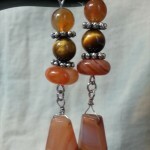 Made from Tiger’s eye, and Red Agate these earring are just absolutely beautiful. 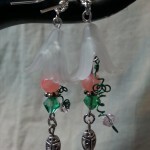 Our Third item we have for you today is something that can be used for Halloween if your deciding to play a fairy. Our Ladybug and the Flower earrings are just adorable, made from acrylic flowers , crystals and metal ladybugs they create the illusion that the ladybug wants to crawl back inside the flower. Last but certainly not least for our Tuesday Madness Sale is our Garnet Enlightened Hand earrings these beautiful earrings are made from rich beautiful colors and are strikingly beautiful making them simply beautiful. 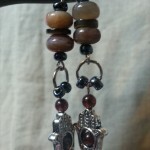 Made from Jasper, penshell and accent beads with gorgeous pieces of garnets nestled inside and just above the hand charms. For an extra added bonus anyone that buys $50 or over gets free shipping that is right FREE SHIPPING all you will have to do to get this is use the coupon freeshipping it is set to give you the discount if you buy $50 or over. IF there are any problems please contact me and I will fix it immediately. Plus if you buy 3 items from our sale pages ( $10 sale , $5 sale items or $20 sale items) you will get 30% off just use 30off when checking out with these items. Plus if you do that and buy up to $50 doing that you can get free shipping and 30% off as well. GET READY FOR THE HOLIDAYS they are growing ever nearer, we do custom orders as well check out our custom order portfolio. Check out our new shipping/delivery options and areas, we now have delivery, and pick up and Ship to the UK. We hope that in the coming weeks that the site will become more and more user friendly. Please don’t hesitate to use our Contact form to give us suggestions on how to make the site even better or what kind of jewelry you would like to see us sell as well. We value your suggestions. We are connected to Google +, Twitter and Facebook so you can catch us there anytime plus we are also on Pinterest. Check out Patreon to see what it is, and come support us there we need it! Patreon Patrons get extra Coupons, Discounts and goodies each month. Previous post: Get ready for Halloween with these haunting beauties!